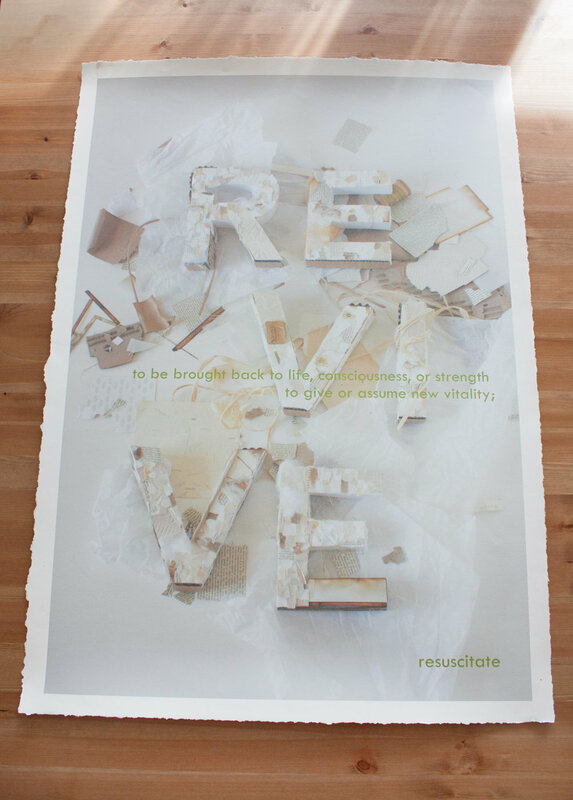 The idea for Revive was to create a typographic poster that would convey a symbolic meaning based on it's appearance. I decided to work with the word 'revive' meaning "to be brought back to life, consciousness, or strength, to give new vitality; resuscitate." I decided to collect scraps of old art projects; printmaking paper, bits of string and any other scraps that fit the sort of neutral colour pallet I was going for. In this way I was 'breathing new life' into odds and ends that would otherwise be thrown away. This surface message speaks to the need for up-cycling, and how even seemingly useless things can find new purpose. There is also a deeper layer of meaning in this piece, revolving around the Japanese pottery concept of “kintstkuroi”. When a piece of pottery has been damaged most often someone will give it up as hopeless and throw it away, or, if it seems manageable, someone may wish to get it repaired, 'as good as new'. The idea of “kintstkuroi” is to repair something to be better than new. In this method, the cracks of the vessel are not hidden, but embraced as additions to the piece. The shards of pottery are mended with gold lacquer resin so that the cracks themselves become a source of beauty and a symbol of the vessel’s resilience. The piece becomes more beautiful for having been broken. The embrace of an items history can very easily be related to the human experience. It is important to embrace the past, the scars, visible or not, that life has left on you, as they help to make you into the person you are today. We are more beautiful, richer and stronger for the things that we experience, even if at the time we can’t see this.